On Sunday, March 26, put on some comfortable and colorful clothes, get some whistles and come to walk with us from Thissio to Zappeion, on a colorful and peaceful walk against what binds us: injustice, inequality, discrimination and climate change! Join your voice with more than 50 organizations, movements, communities and initiatives, reacting collectively and peacefully against any form of environmental degradation and social or political repression. It is a feast for freedom of expression, democracy, peace and the protection of the environment and all life on the planet. The walk is held under the global umbrella of Break Free actions, which take place from 12 to 31 March. In those days, organizations, communities, initiatives and thousands of people around the world will hold peaceful actions to protect the environment, human rights and social justice. In Greece, the issue of action is multifaceted and involves a wider social alliance in order to bring together thousands of people with the same motivation: a collective claim for a sustainable world, with respect for democratic freedoms and human rights. For the first time, we join our voices and break the shackles! 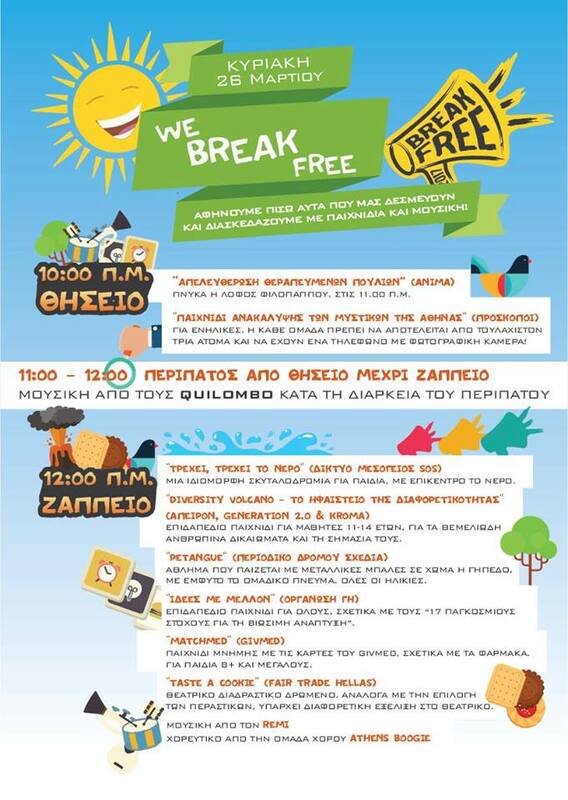 The walk will end up at Zappeion, where there will be games for kids and a Rock ‘n’ Roll party with music by Remi & the road and dancing moves by the Athens Boogie team! Generation 2.0 RED is going to be there, participating actively against inequality, while kids of 11-14 years old will have the opportunity to take part in our floor board game “Diversity Volcano” which is going to be held at the end of the walk, at Zappeion!